Mastering the fretboard of guitar, bass, mandolin, banjo, etc. means knowing every note, in every position, instantly and effortlessly. 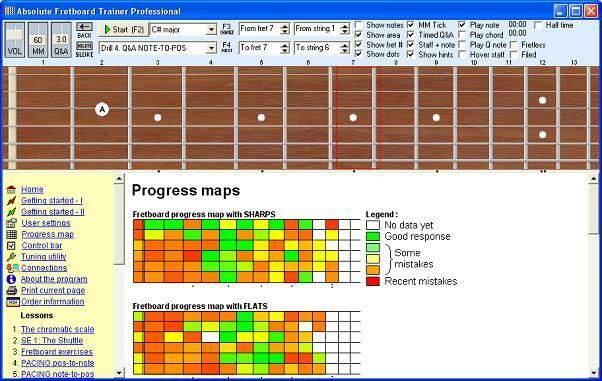 The Absolute Fretboard Trainer will take you there, step by step, through enjoyable, interactive exercises. Download the free trial version and see for yourself how it works! Students, teachers, and other people who are interested in testing their skills in core subjects such as English, mathematics, science, geography and history, or are simply interested in developing their own tests, would find that Academia 3.0 provides a rich set of tests and tools to help people achieve these goals. Advanced vocabulary for French learners. More than 2000 words arranged in 52 topics - the human body (inside and outside), history, the motor car, science, the countries of the world, living creatures, emotions, industry, business and finance. plus 5 grammar topics - irregular present tenses (2), irregular future tenses, irregular past participles and irregular feminine adjectives. Agil's Coloring Book is a coloring activities program for children. It uses Windows Metafile (*.wmf) cliparts, so parents can extend this program's images easily by adding the widely-freely-available WMF cliparts under program's directory. It can save or print colored images, and also has password protection feature.